The nutritional situation in my house growing up was pretty hilarious in hindsight. My mother was very loving and attentive in many ways, but she also worked approximately one million hours per week. Therefore, my sister and I fended for our selves quite a bit at mealtimes. I have so many awesome cereal related memories. Sitting 18 inches from the TV with a bowl of cereal and letting my kitten drink the milk out; taking a bite of cereal in the dining room then running to do a handstand on the couch while I chewed it; or that time we didn’t have any milk so I ate my cereal with red Kool-aid (yes red flavored, not cherry). This is a huge responsibility, I want my son to look at food as sustenance and nutrition for the well being of his body, as well as something to be enjoyed. I love being a mother, not a short order cook. If I put myself on some kind of strange, restrictive diet, or allow my son to survive on “kid foods” that I don’t want to eat, then I’m forced to make multiple meals. No thanks. Any parent knows how incredibly observant kids are. “Do as I say, not as I do” isn’t good enough in my book. Just the other day my son asked me, “why don’t you eat treats very often?” opening the door for a conversation. Whether I’m conscious of it or not, he’s watching every move I make and he’s curious about it. If you’re like me, you’re bound to end up cleaning a few bites off your child’s plate or from a lunch box. Why not prepare the same healthy food for the whole family so it’s not a problem to share the leftovers? I hate wasting food! This is probably my favorite reason to feed my child the foods that I eat. Cooking together is great quality time and really educational (does that sound so corny? It’s true though.). Think about all that can be involved in this: selecting a recipe (either searching the web or a book), reading/writing recipes, shopping for ingredients, measuring, learning how to use kitchen appliances, learning about other cultures through food…so many benefits. Being engaged in the process is a great way for kids to be more open to trying new foods, too. Eating together provides one more occasion throughout the day where those important, organic conversations can take place. I find parenting the most enjoyable when I view activities as quality time and not simply a task that needs to be completed. There’s a multi billion dollar machine designed to market food products to our kids. The first time I really thought about this my son was probably less than 2 years old. His play kitchen came with some little pretend boxes and cans of name brand food products. At first glance it seems innocuous, but I think it’s actually rather disgusting. It only continues with the fast food marketing (“Happy” Meals? Please go away), cross brand marketing (I once saw Teenage Mutant Ninja Turtle tortilla chips on the shelf!). Add that to what is considered a meal in school lunch programs. Have you noticed how homemade food items vs. processed, and even organic vs. conventional produce looks different? I want to take every opportunity to de-program the outside messages my child gets about food. My son still doesn’t love vegetables the way I wish he would, we’re still working on the thousands of exposures. This is a constant work in progress in my house, but a labor of love and a source of enjoyment. It wasn’t until I became a parent that I felt a sense of sharing love through preparing food for others. I’d love to hear other parent’s experiences/suggestions on this topic- please feel free to comment. 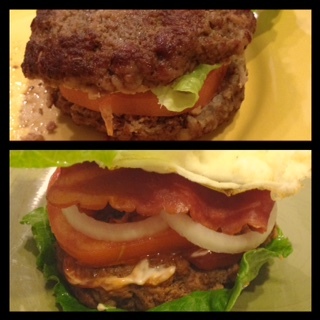 My son made the burger into the bun around his veggies, I used a lettuce bun. This entry was posted on January 19, 2015 by elisabethakinwale. It was filed under Uncategorized . This is such a timely piece. My 8 yr old and I were talking yesterday about a news story that McDonalds was losing money and she asked why we don’t let her eat McDonalds. It turned it a great conversation about making the right food choices for our family. Like you, I don’t run a Waffle House, so all eat the same meal. 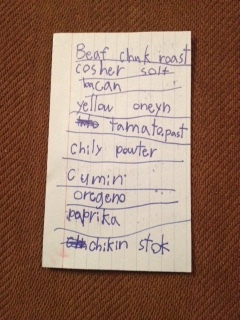 For us, the key is to let our 8 yr old have a say in the meals. She loves zucchini “spaghetti” so I try to incorporate when I can…as for my 2 yr…she will eat anything so we are lucky with her. With that being said, there are some times where we just have to tell our oldest just to eat it, especially when it is a new food item. Thank you for another wonderful piece. Well said. 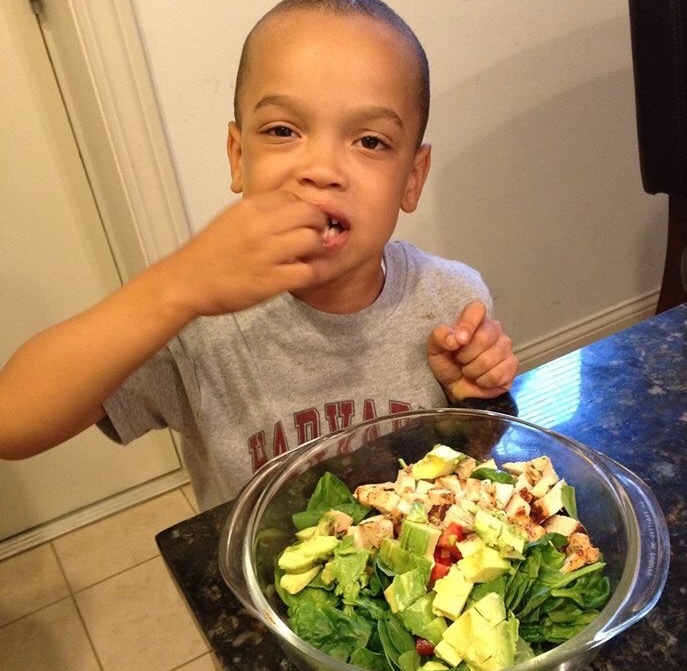 Nothing like an observant kid to keep things honest, especially in regards to nutrition. Great post! I 10000 % agree!! When people tell me “well my child won’t eat this or that” I simply say they never will as long as there is another option. It’s been two years since we embarked on eating whole foods. It’s taken two years to get my picky eater to eat vegetables. She never once starved to death, but there were many nights she didn’t eat because she wanted something else. However, two years later she is in the kitchen with me making cabbage steaks or her favorite breakfast of eggs, tomatoes, and kale. Persistence pays off. I hope they never have to endure the food struggles I did because they are empowered with knowledge of what real food can do for your body. It’s no surprise that you’d post a blog about food choices. Articles like these are extremely relevant in a society that continually tries to influence all of our eating habits and not just children. Your son is on the right path to health because you’re guiding him. Strong work Elisabeth!